Pensées Nocturnes did release a new album in earlier 2016, this time not via long-time label Les Acteurs De L’Ombre Productions (or sub-label Emanations? ), but independently. Therefor I had been kindly asked to write down my nocturnal thoughts on Nom D’Une Pipe!, the third full length by this unusual one-man project. Pensées Nocturnes were formed in 2008 by Vaerohn, who joined Way To End a couple of years ago. He did record and release the albums Vacuum and Grotesque in respectively 2009 and 2011, which were the first releases on the French label Les Acteurs De L’Ombre Productions. Actually, it’s quite bizarre for Pensées Nocturnes’ musique noire does differ quite a lot from what we’re used to expect from this label. 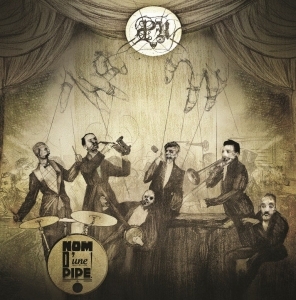 The very same goes for Nom D’Une Pipe!, the third album (as a matter of fact, there was another recording, Ceci Est De La Musique, but it wasn’t but a non-official outlet, so I won’t consider it as a ‘regular’ or official release). But let’s call it ‘open-mindedness’, okay. What Pensées Nocturnes bring is, as mentioned before, quite different from all other stuff on this label, but it actually differs a lot from quite everything one might have heard before. Their Musique is a cacophonous amalgam of different styles and non-styles, strongly rooted in Black and Progressive Extreme Metal, and injected with some operatic voices, saxophone and trumpet, wind bells, accordion (very French indeed; it makes me crave for a piece of baguette with matured Camembert and a glass of aged Saint-Estephe – sorry, make it two glasses). Then it gets add with details from Classical and Martial Music, Avant-garde Jazz, Cabaret, French folkloristic music, Oriental melodies and chants, theatre and comedy at the one hand, and all possible kinds of Prog / Alternative / Rock / Metal whatsoever. Such description might lead to thoughts of pure chaos, and I have to say that it actually is. I do enjoy the three albums I got from this project, but even after several listens, even I am lost. On top there are different samples (at least one comes from the legendary duo Laurel and Hardy! ).